A flag case is the perfect way to honor loved ones that have passed. As the caskets of veterans are draped with an American flag and the flag is given to the family, it is important that these flags not be masked away. The flag case is sized for these memorial flags and smaller ones. 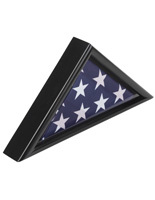 The shadowbox is shaped in a triangle so that the displayed ensign may be folded properly. The flag case, also known as a wood burial ensign case, provides the means to give both your departed loved one and the American flag the honor they deserve. Don't be disrespectful to a military man or woman that served honorably for his or her country. 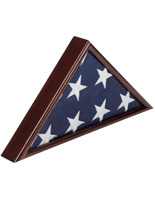 This flag case for sale is the perfect stand to represent this respect and honor. It is a quality product that is engineered to complement every décor. Why purchase flag cases from our company? With quality craftsmanship and low prices, our company makes it easy to buy these shadowbox cases. 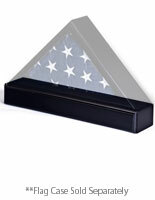 In fact, our company sells these memorial flag cases with the option of same day shipping! Check out our online catalog now to see our complete shipping policy! Who should buy flag cases? 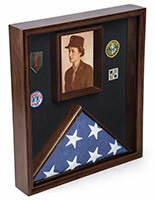 Our shadow box showcases are priced right and are great for retail institutions to resell. 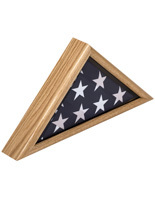 The memorial flag holders are popular with veterans and families of vets and are perfect for institutions that sell flags, engraved items, gift shops, and even military surplus stores. The American flag exhibit case is popular with funeral homes and honor guards that provide burial flags to family members. The shadow box may be given to the family along with the flag. Add a small plaque to the item for a truly personalized exhibit. As family members are grief stricken, they will appreciate the shadow box as one less thing they have to worry about. Quantity discounts make our shadow box exhibit cases even more affordable! 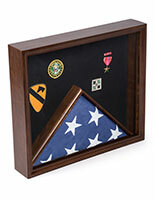 If you are an individual and you have a burial flag, you will want to purchase one of our shadow box displays so that you can give honor and respect to your departed loved one. Don't let the flag sit in a closet, unseen. Your loved one served proudly in the military and would appreciate his or her flag being displayed in his/her honor. 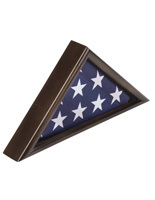 These memorial displays are crafted of solid wood with oak finish or cherry finish. The black finished model is constructed of longstanding MDF. The fine details and craftsmanship of the items give them a fine look that is sure to blend in with any setting. The choice of colors ensures there is one to match every décor. Whether these units are displayed on a mantle, shelf, or counter they are certain to provide that little touch a patriotism to every environment. 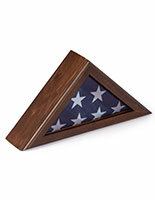 The American flag may be displayed in many ways, and the shadowbox is one way to showcase the flag within a home. These models are sized to fit 3' x 5' flags as well as 5' x 9' flags. The wood frames are sold in two styles: front opening or rear opening. The rear opening models are engineered much like a picture frame. They have metal fasteners that slide to the side so the backboard may be removed and the flag placed within the box. The fasteners are then slid into place to ensure the secure closure of the removable back. The front opening models have a hinged magnetic latch to ensure the door stays firmly closed. Each model also has an optional complementing base that raises the shadow box medal holder just a little so that the entire contents may be seen when the unit is displayed on a tall shelf. These flag holders allow you to insert other items in the exhibit as well. If your loved one earned a special commendation medal, that medal may be displayed on top of the flag. You can even place the emblem of the branch of service the individual served in within the box. While we refer to these units as burial showcases, they are also ideal for exhibiting flags that have been flown over special locations such as ground zero, the White House, a state capitol building, or on a military installation. Add an engraved plaque to the outside of the case to explain where the flag was flown. (Our catalog does not include the plaques.) These shadow box displays are also great for exhibiting other items. The triangular design gives them a distinctive look as you showcase the emblems of schools and other organizations along with ribbons, medals, and awards earned by children and other family members. The creative individual will find many ways to use these wood shadow boxes.